"Day & Son's First Folio Facsimile"
Shown here is the title page from the SUNY Buffalo State First Folio facsimile from 1866. SUNY Buffalo State’s First Folio facsimile was one of the many published in the flurry of excitement surrounding the Shakespeare Tercentary, an event held at Stratford-upon-Avon celebrating Shakespeare’s three-hundredth birthday, in 1864. Day & Son publishers released the facsimile in 16 monthly parts from 1864-1866 and eventually gathered it into one single, leather-bound volume. SUNY Buffalo State’s copy still retains this original leather binding. 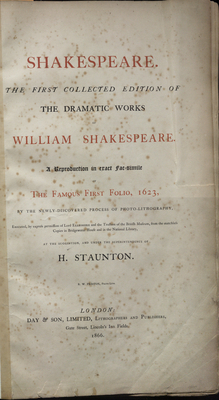 Among a sea of good and bad reproductions of the First Folio, Day & Son’s facsimile stood out by using state-of-the-art photographic reproduction pioneered by chess player and Shakespeare editor Howard Staunton. Upon the facsimile’s release, The Bookseller journal called it “a miracle of accuracy” and it was advertised extensively in promotional materials for the Tercentary. However, the strength of the facsimile was not enough to save Day & Son. By the time the First Folio was completed and released as a single volume in 1866, Day & Son was on the verge of bankruptcy. Day & Son, although once considered one of the finest lithography presses in England, had suffered a series of losses in the early 1860s and had already begun to sell off some of their engravings to remain afloat in 1865. The First Folio reproduction’s accuracy could not save Day & Son and, by the end of 1866, the firm would face liquidation. “Treasures in Full: Shakespeare in Quarto: 3. 19th Century,” The British Library, accessed March 25, 2016, http://www.bl.uk/treasures/shakespeare/prtshake19thcentury.html. Alan Galey, “Reading Shakespeare through Media Archaeology” in Shakespeare in Our Time: A Shakespeare Association of America Collection, eds. Dympna Callaghan and Suzanne Gossett (London: Bloomsbury, 2016), 103. Quoted in Christopher Decker, “Shakespeare editions” in Shakespeare in the Nineteenth Century, ed. Gail Marshall (Cambridge, UK: Cambridge University Press, 2012), 21. See the monthly editions of the Publishers’ circular and booksellers’ record for 1864. See Kathy Kajander Tidman, “A Lithographic House: Day & Son” in Art for the Victorian Household (Online Originals, 1997), accessed February 12, 2016, http://www.onlineoriginals.com/showitem.asp?itemID=104.